In your quest for sales, do you leverage the value of lead nurturing? Sales leaders know that in the process of converting a raw Lead to a Prospect, and then to a real Opportunity, and ultimately to a Customer, there are often many nuances and inflection points in the conversation, with the result that the sales process is almost never linear. Those nuances can include shifts in the Prospect’s priorities, needs, and role in the buying process. These things must be verified repeatedly to detect changes in Prospect status and respond accordingly. If you don’t frequently check them, your sales forecast becomes a fairy tale, and you won’t know where your next meal is coming from. You could be ignoring imminent buyers or focusing too much on long-shot prospects, and not even know it. Either way, you lose. 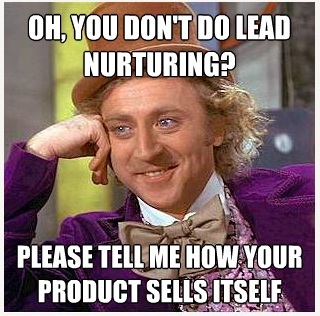 Lead Nurturing helps you keep on top of the changes. Click here for a free, crowdsourced process guide to help improve your forecasting. A recent project we performed for Pluris Marketing, provider of OCDP (omni-channel dynamic profiling) solutions for large consumer marketing organizations, transformed from simply securing executive appointments to also nurturing leads, and illustrates how lead nurturing contributes value to the sales pipeline. Establishing a dialogue with as many prospects as possible enabled us to train our ears to the “Voice of the Customer” so we could determine what value people derive from Puris’ solutions – in their own words – and tweak our campaign messaging to improve relevance. In short, what you call yourself is often not as important as what your customer calls you. Example: the phrase “Dynamic Profiling” is a term borrowed from a Prospect – not something Pluris dreamed up. Nurturing leads enables us to captivate and sustain a broader, interested audience, improving our place in each prospect’s “Initial Consideration Set” of potential options when they decide they need a relevant solution. The sheer number of “nurturables” far exceeded the number of immediate sales appointments generated under this project. The number of nurturables alone caused our client to take notice of the opportunity. 1) Relevance – People typically perceive immediate needs as more relevant and more urgent than future problems. No matter how relevant you think your offering is, your Lead’s opinion matters more. You stand a far greater chance of converting a Lead to a Prospect if they view your solution as currently relevant. 2) Consequences – People tend to discount the importance and consequences of future events. A distant goal or pain is less motivational than a current one, even if delay portends grave consequences. Moreover, people tend to see future consequences – even grave ones – as less important with every year such action is delayed. The farther into the future a need is projected, the less likely it will be perceived today as ever becoming important. Illustrating the Relevance and Consequences phenomena, Columbia University researchers found that the average person finds little difference between getting $250 now or $350 a year from now. Imagine that! You could opt to wait a year and earn 40% on a surefire outcome, or you could take the money now and forego the potential 40% greater financial benefit. You don’t need to be Warren Buffet to know that no investment vehicle can guarantee you a 40% one-year return on principle just by delaying receipt, and yet most people queried would rather have the money now, consequences be damned. Heavily discounting future benefits or consequences can greatly distort corporate thinking, behavior and beliefs. As maddeningly illogical as human nature may it may seem, your appreciation of this phenomenon actually becomes your competitive advantage if you have a Lead Nurturing program that helps prospects learn, appreciate and promote the importance of your solution. An effective Lead Nurturing program, including content marketing mapped to each prospect’s unique persona and information needs, enables you and your prospects to keep the discussion channel open and lively. Rather than attempt to drive each prospect toward near-term action, you instead conduct periodic relevant communication, build productive relations, and assist prospects in evaluating your offerings, so that they can intelligently shift priorities toward considering and adopting your solution – perhaps even sooner than they expected, but in any case, willingly. If done well, you can identify the “hand raisers” worthy of greater attention and likely to buy, and even determine their decision time frame. Driving toward a sale too hard or too soon can be viewed by the Lead as pushy, inattentive and ignorant, and typically leads to a fall-off in response, inattention to your future communication attempts or, worse, unsubscribing from your feeds and possibly treating your ill-timed, irrelevant communication as unwanted spam. We’d all like to believe that prospects discount our pushy, sales-y human failings and focus instead on the merits of our offering, but you are more likely to hold one another’s attention over the long term if you actually listen, check for understanding and nuanced changes, and respond accordingly with relevant information. In your eagerness to bring in more sales this calendar quarter, don’t risk alienating a next-quarter sale. The Leads you start to nurture today rarely move as quickly as you’d like, but a constructive, open dialogue helps you understand your relevance in the Prospect’s view so you can tune your messaging to match, while also giving them something to share within their own circles of influence to build consensus toward adopting your solutions. Patience and persistence pay, and lead nurturing is the currency. This entry was posted on Monday, September 3rd, 2012 at 4:15 PM and is filed under content marketing, demand management, inbound marketing, lead generation, sales forecasting. You can follow any responses to this entry through the RSS 2.0 feed. You can leave a response, or trackback from your own site.